With one of the highest concentrations of hard classic routes, the Storm Boulders offer a virtual playground for strong climbers to explore and get shut down on. Classic V6s reign supreme in the Storm Boulders - Terrorist (V6) and Ride the Lightning (V6) are some of the best in the park and are both incredibly unique. For you super humans this area holds roughly 21 routes V6 and harder. Dont forget to tick off the fun moderates like Zap (V3) and Vintage (V4). 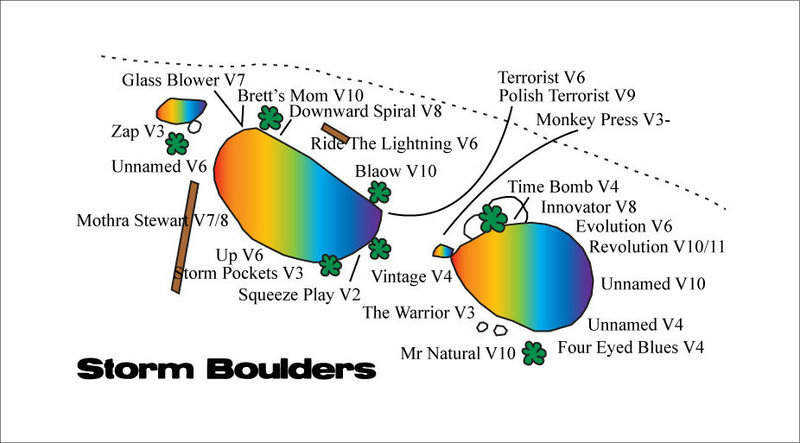 Follow the main trail past The Zoo and Split Boulders there will be a boulder on your right with a left leaning crack (Ride the Lightning V6) these are the Storm Boulders. The Storm Boulders have a bunch of hard lines.